2)	Dinner Plain has an abundance of unique chalets painted only in colours found in the trunks of the surrounding snow gums. Don’t know how to ski? Dinner Plain is the perfect place to learn. Don’t want to ski? They’ve got you covered, too. Here, six awesome ways to have fun in the snow without strapping on skis. Dinner Plain has a number of marked trails that wind through the beautiful alpine backcountry dotted with snow gums. These trails are groomed from June through September, which makes them ideal for cross-country skiing and snow-shoeing. For a peaceful walk with only the sound of snow crunching underfoot, you can hit the trails yourself. Or for a more indulgent experience, book a guided evening tour with Hoys Ski Hire; the tour includes drinks by an open fire, a French fondue experience and a three-course dinner. Sled dog tours are one of Dinner Plain’s most popular attractions. If you’d rather be escorted through the winter wonderland that is Dinner Plain’s backcountry, a dog sled tour is truly a bucket-list experience. Run by Howling Husky Sled Dog Tours, sit back as a team of beautiful huskies pull you through snow-covered alpine scenery on an exhilarating ride. To top it off, enjoy a cuddle with your tour guides at the end. Dinner Plain is home to Australia’s highest brewery. At an altitude of 1550 metres, Blizzard Brewing Company uses snow-melt to brew its beers; that’s fresh, pure Victorian Alps spring water from the high-altitude aquifers of Dinner Plain. Enjoy a tasting paddle of the craft beers with a snack plate of local produce, or take a brewery tour to find out more about Australia’s only brewery located above the snowline. The Pea Shooter Toboggan Slope in Dinner Plain is free to use. Featuring a Japanese-inspired onsen and indoor heated pool, the Onsen Spa and Retreat is a blissful spot to spend a frosty day in Dinner Plain. Heated to 39 degrees, soak and re-energise in the outdoor onsen, indulge in a massage or facial treatment at the spa, or take part in one of the wellbeing classes. 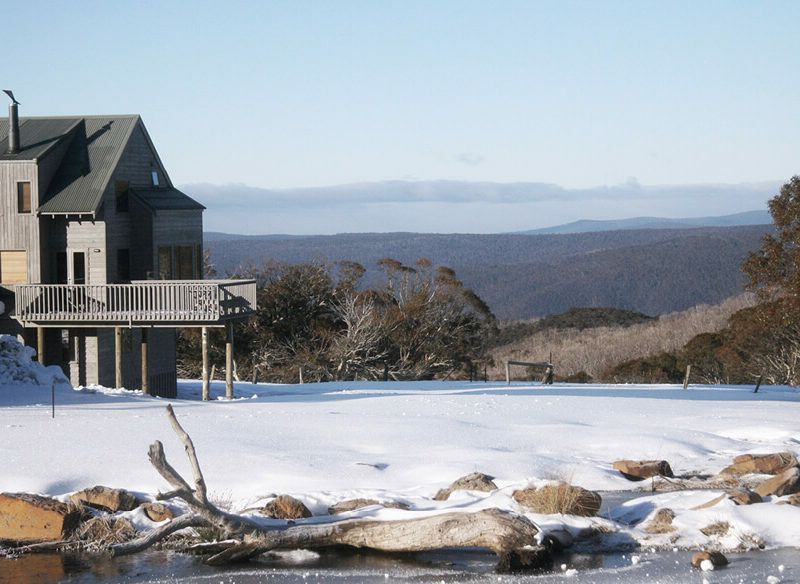 The Alpine National Park was once home to hundreds of huts used for cattle graziers, travellers and pioneer skiers. Most of these huts have been destroyed by time and the elements, including a fire that swept through the area in 2003, but there are still around 60 huts and ruins. Five of these, one of which was built in 1993 as a set prop for the film The Silver Brumby, are easily visited from Dinner Plain. Laser skirmish in the snow? Yes, that’s a thing! Run by the team behind the dog-sledding tours, Alpine Laser Skirmish is played on a small outdoor course, perfect for some family fun, or a one-acre course up the road at Mt Hotham where more intense ‘tactical battles’ can be played. There’s a shuttle bus that runs between Dinner Plain and sister resort Mt Hotham, where you’ll find some of the best ski runs in the country.